Kenneth Winston Starr (born July 21, 1946) is an American lawyer who has also been a United States circuit judge and U.S. solicitor general. He is the former president and chancellor of Baylor University, and formerly held the Louise L. Morrison chair of constitutional law at Baylor University Law School. He headed an investigation of members of the Clinton administration. He received the most publicity for his tenure as Independent Counsel while Bill Clinton was U.S. president. Starr was appointed to investigate the death of deputy White House counsel Vince Foster and the Whitewater real estate investments of Bill Clinton. The three-judge panel charged with administering the Independent Counsel Act later expanded the inquiry into numerous areas including suspected perjury by Bill Clinton's. After several years of investigation, Starr filed the Starr Report, which alleged that Bill Clinton had lied during a sworn deposition. This led to the impeachment of Bill Clinton and the five-year suspension of Clinton's law license. Starr was born near Vernon, Texas, and was raised in Centerville. Starr attended Sam Houston High School in San Antonio and was a popular, straight‑A student. His classmates voted him most likely to succeed. In 1970, Starr married Alice Mendell, who was raised Jewish but converted to Christianity. Starr attended the Church of Christ–affiliated Harding University in Searcy, Arkansas, where he was an honor student, a member of the Young Democrats and a vocal supporter of Vietnam protesters. He later transferred to George Washington University, in Washington, D.C., where he received a Bachelor of Arts degree in history, in 1968. While there, he became a member of Delta Phi Epsilon. Starr was not drafted for military service during the Vietnam War, as he was classified 4‑F, because he has psoriasis. He worked in the Southwestern Advantage entrepreneurial program and later attended Brown University, where he earned a Master of Arts degree in 1969, and then Duke University School of Law, earning a J.D. in 1973. After his graduation from Duke, Starr worked as a law clerk for U.S. circuit judge David W. Dyer of the United States Court of Appeals for the Fifth Circuit (1973–74). Later, he clerked for chief justice Warren Burger of the Supreme Court of the United States (1975–77). He joined the Washington, D.C., office of the Los Angeles–based law firm Gibson, Dunn, & Crutcher in 1977. He was appointed counselor to U.S. attorney general William French Smith in 1981. On September 13, 1983, he was nominated by Ronald Reagan to a seat on the United States Court of Appeals for the District of Columbia Circuit. He was confirmed by the United States Senate on September 20, 1983 and received the commission on September 20, 1983. His service terminated on May 26, 1989, due to resignation. Starr was the United States solicitor general, from 1989 to 1993, under George H. W. Bush. 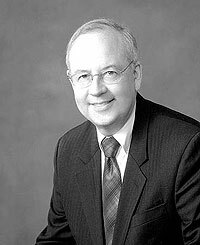 Ken Starr Facts for Kids. Kiddle Encyclopedia.